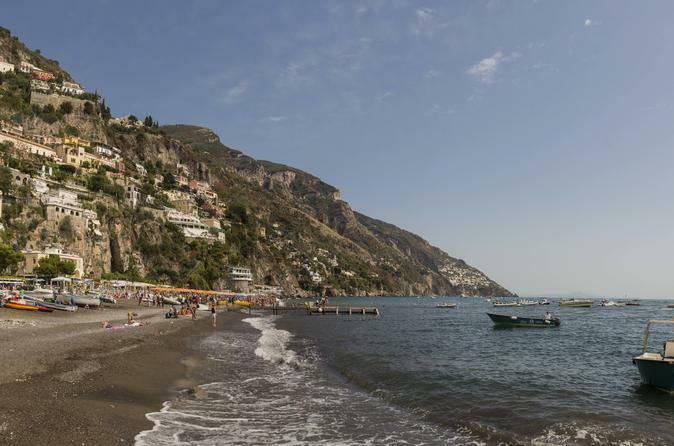 No se pierda dos de los destinos del sur de Italia que figuran en la lista de la UNESCO con este viaje de un día completo a Pompeya y la costa de Amalfi desde Roma. 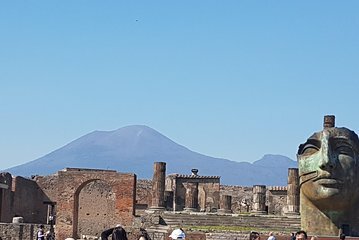 Visita las fascinantes ruinas de Pompeya, donde puedes caminar a través de una antigua ciudad congelada en el tiempo por la erupción del Monte Vesubio en el año 79 DC. Continúe hacia la espectacular costa de Amalfi, con una vista panorámica del pintoresco pueblo pesquero de Positano. Disfrute de tiempo libre para explorar y explorar tiendas únicas hechas a mano en Positano y la ciudad vecina de Amalfi. El tamaño del tour es limitado para una experiencia más personalizada en grupos pequeños. Excelente tour, la guia y el conductor de la van muy buenas personas. Nos tocó un largo viaje, pues era fin de semana largo. Lo recomiendo! The tour was okay, but if I had it to do over, I would have taken the train and visited the areas myself. The Pompeii tour was too short, and I didn't feel like it captured all of the parts of Pompeii that I wanted to see. We only had about 2 hours to wonder around Positano, and only 15 minutes to wander around Almafi the group was forced to waste time in a gift shop in Almafi tasting lemoncello, which we could have done anywhere. Having said this, the tour guide and driver were both fantastic and went out of their way to make us comfortable. It's a lot to cram into one day. Our guide, Ada, and driver, Giuseppe, were outstanding. We were lucky to have just our family of 5 in the van for day, and Ada provided thorough and interesting info along the ride and during the outing. I can't say enough about this tour - she showed us hidden gems at Positano and along the Amalfi coast, and Giuseppe was a fantastic driver. Such a beautiful area and so worth it, especially if you don't have much time. Pompeii was wonderful as well a most entertaining guide, Daniel. Perfect day! Roberto and our driver Marco arrived on time and could not have been more knowledgeable. The trip was beautiful and they went above and beyond to insure the rest our trip would be as enjoyable as our visit to Pompeii and the Amalfi Coast! I had no idea how large Pompeii was. The city guide was so knowledgeable and took the time to explain the layout of the city and to answer all our questions. Amalfi has to be one of the most beautiful areas in the world. Great tour. Van picked us up on time. Both the driver and tour guide were knowledgeable and great at their profession. Appreciated the commentary on the drive. Guide at Pompeii was also very good and made for a most enjoyable tour. Drive to Amalfi was beautiful as is the city. Great day! The pick and drop to hotel was good. The places were good. But the transport within Amalfi was not good. Also we were three people, 2 sisters and our mother. Our mother was in a wheelchair and we never got to complete the tour as it was not wheelchair friendly. unfortunately the call centers that you have in the USA for VIATOR are all liars. They always speak lies to get our credit cards charged and give us false information. It was a waste of money to be honest. I know nothing about Pompeii. Also we were put in a small cart which was very dangerous to take us to the restaurant in Amalfi. That was so weird as it was so dangerous, as the back was open and we were in the back of the mini truck. Viator is full of lies in their call center. When we meet the tour guides they say that they were not told about the wheelchair. It was a mess. The drive to and from the Amalfi Coast/Pompeii took up most of the tour, which we did not realize would happen. We only got 2 hours in Pompeii, 30min in the Amalfi Coast, and 1.5hours in Positano. The drive from Pompeii to the Amalfi coast was VERY windy and steep. It was extremely beautiful! It is not for those that get motion sick. We would have liked to have the opportunity to stop at a look-out point or 2 along this drive to stop and take some pictures. Lunch was very late, not until we arrived in Positano, around 2:30pm. Had we known this, we would have eaten a hearty breakfast. The Pompeii tour guide, Hector, was exceptional and had a great sense of humor. Excellent tour! Was very glad we booked this tour with the itinerary starting from Pompeii rather than ending there. Much better to do Pompeii in the morning before the crowds arrive. We had a great experience with the company - everyone we dealt with was friendly and helpful. Our guide Andrew was knowledgeable, friendly and efficient - he thought of everything places to stop for fantastic photos of the Amalfi coast, the perfect restaurant for lunch and was flexible enough to adjust the program a little bit at the end so we got to do a little more shopping :-. Our driver Giuseppe was excellent too...felt very safe along the winding cliff roads with his steady driving. It was an amazing experience and I highly recommend the tour. A great tour, not to be missed.